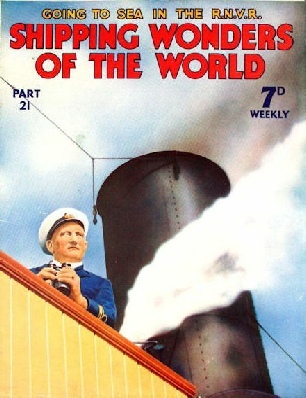 Part 21 of Shipping Wonders of the World was published on Tuesday 30th June 1936. This issue included a colour plate illustrating “The Stormy Seas of the Atlantic Ocean” which was previously featured on the cover of part 6. It was attached to page 653 of this issue. This week’s cover shows the Captain of the SS Eston, a P & O coastal cargo boat, on board ship. The Eston is a freight service boat on the home trade, and has a gross tonnage of 1,487, a length of 240 ft 2 in, a beam of 36 ft 1 in, and a depth of 19 ft 1 in. The story of Columbus’s discovery of the New World, concluded from part 20. This little vessel, the Aronia, typical of many modern yachts and thus not a merchant ship, is included in this series for convenience. She is propelled by diesel engines and her hull is of a form known as the “toothpick” type. She was built and engined in Denmark and the drawings show that she has a hull form somewhat similar to that of a torpedo-boat destroyer. This is particularly marked in the cruiser stern, the arrangement of propellers and the spade rudder. She has twin screws. Her length is 135 feet, her beam 17 ft 6 in and her depth 11 feet. Her minimum draught in service is 7 ft 6 in and her speed with the twin screws is 15½ knots. At one stage this yacht was owned by Jack Billmeir, owner and founder of the Stanhope Steamship Company. This is the sixteenth article in the series on Merchant Ship Types. Since its formation in 1903, in place of the older Royal Naval Artillery Volunteers, the Royal Naval Volunteer Reserve has grown in importance as well as in numbers. A volunteer organization, with divisions in many parts of Great Britain, the RNVR offers to the sea-loving man who lives ashore the opportunity to train for naval service. The RNVR, the “Wavy Navy”, as it was affectionately called during the war of 1914-18, supplies young men with the opportunity of seriously serving the sea in their spare time. The RNVR has no counterpart in any other maritime country. A proportion of its officers and ratings are yachtsmen, but the majority have no opportunities of yachting. The work done by the RNVR in the war was of the most useful and valuable kind and many RN Volunteers distinguished themselves. One was selected to be Chief Yeoman of Signals in the Fleet Flagship. Signalling is rightly regarded as a highly specialized job and it was a a wonderful tribute to the efficiency and training in the RNVR that a man who was, after all, an amateur, should have been given this post. After the war the RNVR was reorganized and many divisions and sub-divisions were formed in different pars of the country. This chapter is by Frank C Bowen and is the third article in the series Going to Sea. There is a separate article on the Royal Naval Reserve in part 51. THE STORMY SEAS of the Atlantic Ocean do not present such dangers to the modern liner as they did to the earlier sailing vessels. This photograph was taken from the aft deck of the tourist class quarters in the Norddeutscher Lloyd liner Bremen, 51,656 tons gross. This deck is 36 feet above the water-line. The velocity of the wind which raises such seas is between 34 and 40 knots, and would be described as a fresh gale, Number 8 in the Beaufort wind scale. A hurricane, the strongest wind that ever blows, is Number 12 in this scale, which is invariably used by navigators to denote the strength of the prevailing wind. Number 0 in the scale, on the other hand, indicates a wind velocity of under one knot. A complete pictorial history of the development of ships from the earliest times to the present day can be traced from the designs of postage stamps issued by many countries. Nearly all maritime nations of the world have issued at one time or another postage stamps that picture some form of ship or boat. Some are crude and inaccurately drawn, others are nautically and artistically correct. The United States heads the list of nations with the greatest number of stamp designs, incorporating pictures of ships from a Norse galley to a modern mail liner. Portugal has probably issued the next greatest number of ship stamps. This chapter, by Boyd Cable, is full of shipping interest. Although some of the stamps reproduced are familiar, many are comparatively rare and, indeed, he was able to obtain the illustrations only through the courtesy of Stanley Gibbons & Co, the well-known philatelists. As the chapter is intended for a public not chiefly concerned with postage stamps, no attempt has been made to keep the illustrations to correct relative sizes. On January 29, 1917, the trials of K 13, a new submarine, were carried out in the Gareloch, on the Firth of Clyde. Without warning, the great submarine sank, but heroic measures saved the lives of over half the number of those on board. This chapter is by David Masters and is the seventh article in the series Dramas of Salvage. You can read more about this salvage in chapter X of David Masters’ book The Wonders of Salvage. The article concludes in part 22. When steam propulsion came into general use many sailing vessels were equipped with auxiliary engines. For many years, when steamships were still in an early stage of development, they carried sails and were really auxiliary steamships. It was a long time before shipmasters and owners began to think solely in terms of steam. This attitude was due not to conservatism, but to the huge consumption of coal in steamships and also to the high standard of efficiency maintained by the sailing vessel. It was not until the triple-expansion engine had been introduced that the steamship's ascendancy was firmly established. No modern steamships are equipped with sails to-day. The modern diesel engine is now often fitted to small sailing craft and has thus helped to prevent the disappearance of sail from the seas. This article is by Sidney Howard. reproducing outstanding covers as colour plates in later parts, I have already published the colour plate of the Lightning in Part 10. 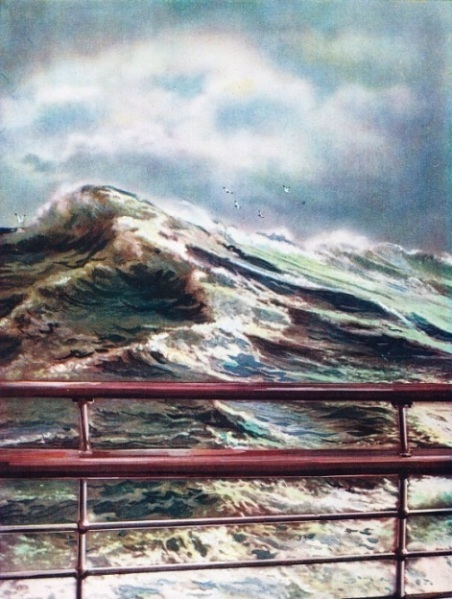 This week our colour plate is the picture of a big sea, taken from the deck of the Bremen - a particularly fine photographic impression of the stormy North Atlantic.” This illustration was previously used as the cover for part 6. The Bremen also features on the covers of part 11 and part 20. The policy of Government subsidies for American shipping has been dictated by economic circumstances which have existed since the United States were first established. The work of the United States Shipping Board has made the American Merchant Service the second largest in the world. In sailing-ship days, the Americans were noted for their beautiful and speedy clipper ships. Later on, American shipping suffered from many adverse influences. After the war of 1914-18, however, the Americans foresaw a boom in shipping and, with typical business acumen, prepared to make the most of it. The Untied States Shipping Board was created in 1916 to foster merchant shipping and in more recent years large subsidies have been paid by the US Government to shipowners and builders. This chapter tells of the economic conditions that lie behind American shipping and describes the vessels on the various services. It deals also with distinctive American types. This chapter is by Frank Bowen and is the second article in the series Sea Transport of the Nations.